When I have a bunch of leftover meat I tend to make fried rice. I’ve made it with leftover fried chicken, porchetta and yes, even pulled pork. 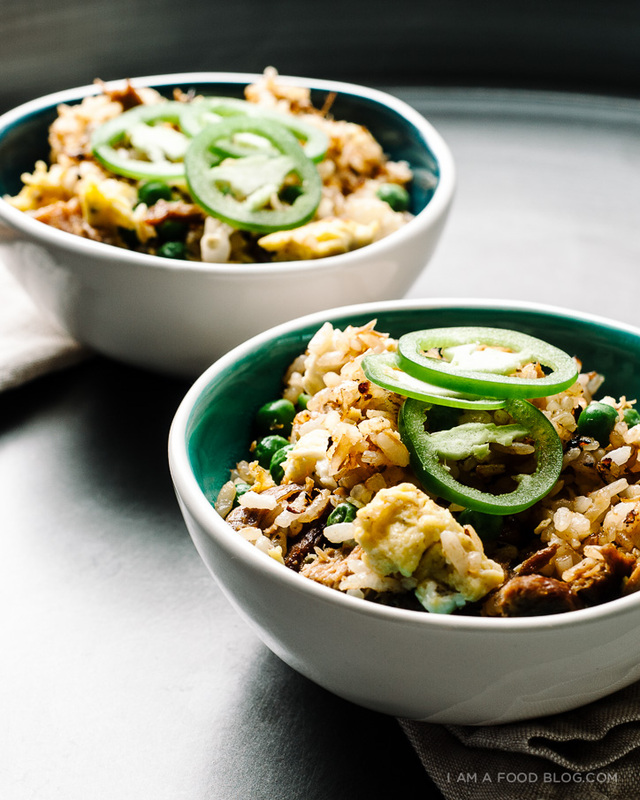 Pulled pork fried rice is definitely a bestovers kind of thing. You can clean out your fridge and make something that is almost even more delicious than its starting point. Everyone does fried rice differently and I love that it’s so customizable. Someone should open a fried rice version of Chipotle. They’d have giant vats of old, cold rice (an absolute necessity for good fried rice, trust me) and tons of add-ins for people to choose from. The possibilities are truly endless. You’d go through the line and your first choice would be white or brown rice (maybe even quinoa as a healthier choice). Then you’d get to choose your protein (beef, chicken, pork, fish, tofu, eggs), your veggies (peas, beans, carrots, peppers, corn, broccoli) and how you want it seasoned (salt, soy sauce, sriracha). They’d fry it all up to order and it would be so, so good. This fried rice would definitely be one that I’d order. The pulled pork crisped up nicely, the eggs were fluffy, the peas bursting with bite and the jalapeños spicy. I used a teriyaki pulled pork here, but of course, you can use any kind of meat (or meat alternative!) you like. What your favourite kind of fried rice? 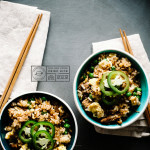 This one was good, but kimchi bacon fried rice almost always comes first in my books! Crack your eggs into a bowl and whisk. Season with salt and pepper. In a large skillet or wok, heat up a bit of oil over high heat and scramble your eggs until mostly set, but still slightly runny. The eggs will cook a bit more when you fry all the ingredients together. Remove and set aside. If the skillet is dry, add a tiny bit more oil and then add the pulled pork. Fry over medium high until crispy and hot. Add the rice and fry, stirring occasionally and breaking up the rice until the rice is crispy and heated through. Add the eggs, peas, and sliced jalapeños into the skillet and fry and mix until everything is evenly distributed. Taste and season with salt and pepper. Serve with sriracha, if desired. YES. This looks so, so good! 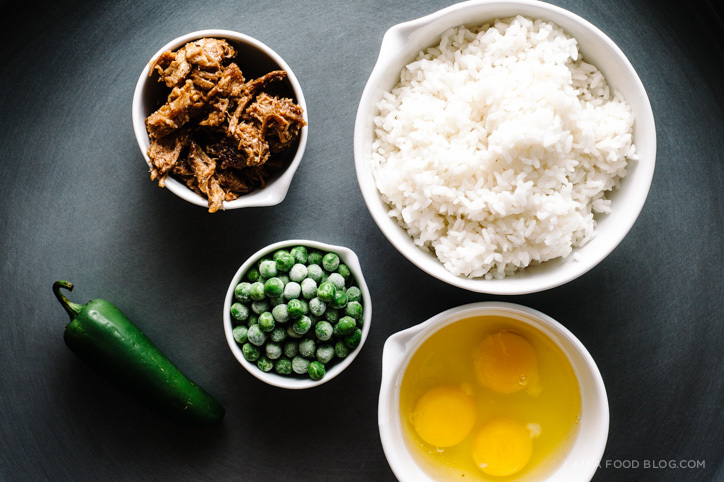 I can just imagine how the pulled pork crisps up, and looove peas and jalapenos in my fried rice. This is perfect (although I may have to agree with you on kimchi fried rice too!!) Um, also — a fried rice Chipotle needs. to. exist. I would probably go broke on it. 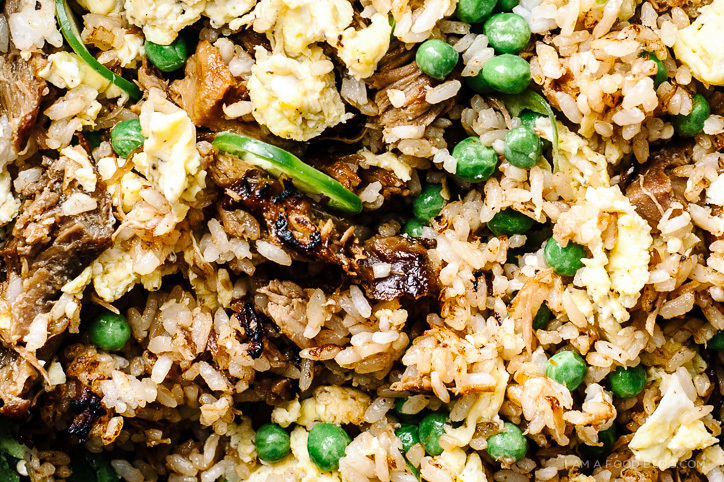 OMG, that fried rice version of Chipotle sounds absolutely genius. Want to open it together?! 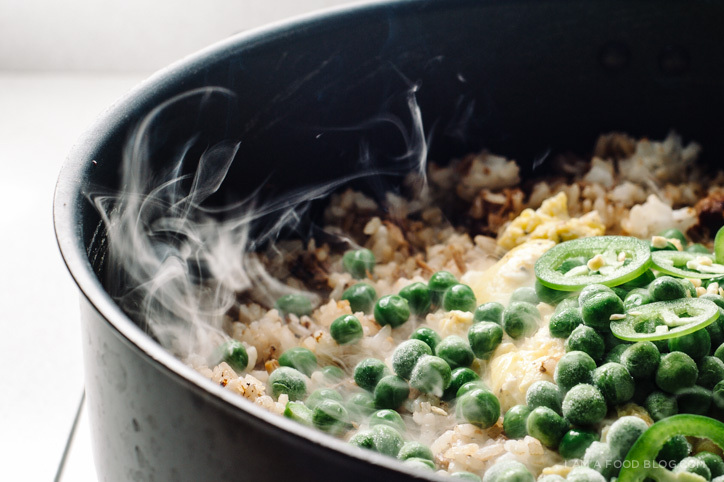 What an awesome idea for fried rice, this looks incredible! Sounds great! How much rice? gahhhh fried rice chipotle!!!! yesyesyesyesyesyes. should we have a fried rice party a la your grilled cheese party? i think so. i was just in the mood for fried rice yesterday but also kind of frustrated because whenever i make it, it tastes the same! i needed new ideas for flavors and such and BOOM HERE IT IS! i’ve never added peas or jalapeños, but we happen to have a crap ton of peas in the garden, so yes, i think i’ll be making this tonight! I LOVE PULLED PORK AND FRIED RICE. Genius combo! 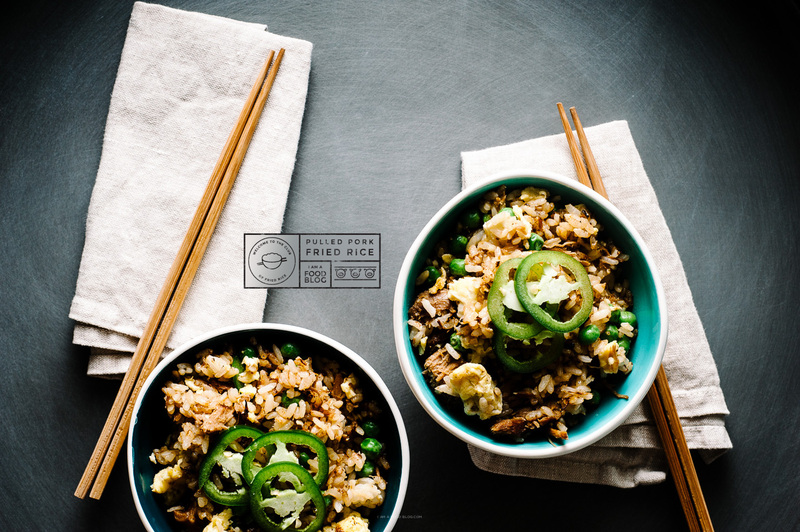 My go-to weeknight fried rice includes: peas, eggs, onions, bacon, soy, sriracha. But my favorite is when my sister bakes a fall-apart brown-sugar ham (I’m talking so juicy and tender you basically have pulled ham, not that spiral-sliced BS), and I put that business in my fried rice! OMG YES to all of this! a fried rice version of chipotle would be wayy better than the actual chipotle. Let’s make this happen! or even like a fried rice party? Too far? For our fried rice we usually do some peppered bacon and tons of garlic and then just whatever vegetables we have in the fridge. There’s a local place though that’s a korean fusion joint that has rice bowls and they top them with fried shallots and cilantro and I can never get enough. Your fried rice Chipotle idea is genius! I love pretty much any fried rice, but my husband orders crab fried rice a lot and it’s GOOD. This recipe is making me really hungry. I love pulled pork. This SO SO has to become a business!!! Fusion food is the thing. A food truck would be a hit – especially because you have all the right words (“chipotle”, ‘fried”, “pork”). I’m making this as soon as I have access to some chinese bbq! This is fired rice done right! Looks so good! This looks amazing. I love your photography! Um yes you need to open this Chipotle-esque fried rice place! no, that doesn’t sound weird at all. coconut fried rice sounds awesome! This looks insane! I once had a steak fried rice that I still dream about. Chipotle/ fried rice joint, what could be better?! I think pulled pork fried rice would be great! My family makes homemade pulled pork, this would be a great way to use leftovers! I want a fried-rice chipotle soooo bad! Honestly, and I think you already know this, my favorite fried rice is Spam and pineapple via your genius :) But since I stopped eating meat (sigh…) I have been making fried rice using Sichuan chile oil with as many veggies as I’ve got on hand and a fried egg. I could eat it EVERY. DAY. This version here looks soooo good! I mean, teriyaki pulled pork?!?!? For those of you craving a fried rice chipotle, come to Atlanta and go to Chow Baby! It’s everything you could hope for and has soooo many options. You could go to BD Mongolian Grill or Stir Crazy for your fried rice craving! I’m guessing that the peas get steamed then added after everything is cooked together? the peas don’t need to be cooked separately, just add them in when you add in the jalapeños! great recipe , family love it, had the pulled pork with BBQ sauce and then added soy sauce on the finished article, was just the job. Did not use day old rice but will try it, need to think of meals in advance, as I spent quite a bit of time with the wok trying to get the rice to separate into individual grains. Overall great cooking experience, now added it to my repertoire. Great and easy recipe to follow. I was wondering what I can do with our pulled pork leftovers. Just made it for breakfast this morning (yes, my husband and I had this for breakfast — delicious!). I’m hoping to will last until at least the middle of the week so we can take some for lunch at work. There is actually a restaurant in Amsterdam called Walk-to-Wok that functions kind of like a fried rice Chipotle! Except you can choose from several varieties of rice AND noodles, and then pick your proteins and veggies and sauce, and it gets stir-fried right before your eyes. Sooo good! Anyway, I love pulled pork, and I’m going to do a week-long pulled pork feature on my blog soon, so I’ll definitely add this into the menu!! They have a place that does this in Chattanooga it is called Ghengis Grill.. It is exactly what u described and the food is delicisious..
Kindly pardon the novice-fried-rice-cooker question but, what type of oil do you recommend? Thanks. when cooked you have an egg sheet,cool and slice into ribbons THEN add to rice.